Keith from Faction Bike Co. needed a place to crash on Friday night after competing in the Morrow Snowboard Jam at Hemel Hempstead Snow Centre. This was comp four of a four comps in four weeks mission covering surf, skate, BMX and snow, a pretty awesome achievement! Keith was in town to meet a local rider and do some filming, but before he set off I got my first opportunity to have a roll around on his production Faction Amero bike. I’ve not had a BMX since I was about 7 years old, so I honestly couldn’t say whether I preferred it to a regular 20″ wheel bike, but what I can say is that the Amero felt great! Not only did it feel good, but the Amero is really well spec’d. too, where bigger bike companies might not do things to keep within a particular price bracket, it’s like this was designed without any such restrictions, they just did everything to make not just the best 22″ BMX, but the best BMX they possibly could. 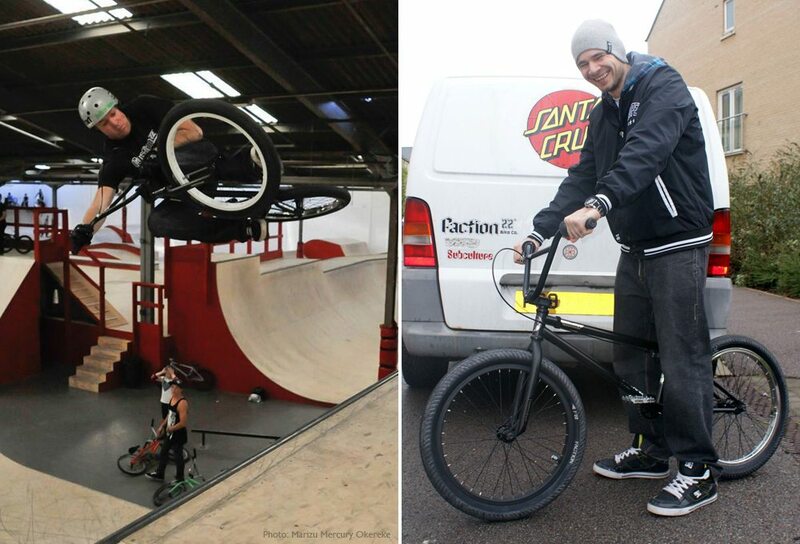 Here’s Keith round 3 of UK BMX vert series, and me with the stupidest big cheesy grin. As soon as the A4 is back on the road and the syphon from my bank account is disconnected, I’m buying one!